Denver, Colorado. 0900L (9AM). I am headed due east out of Denver on I-70. 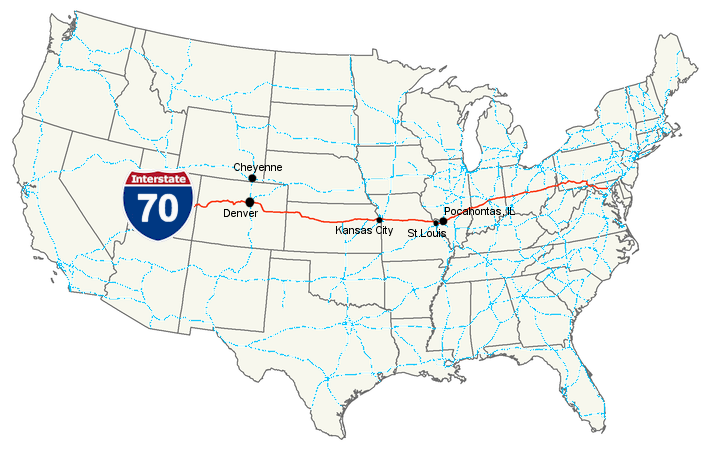 I-70 snakes through Colorado, Kansas, Missouri, Illinois and onward for the eastward traveller, through the major cities of Kansas City and St. Louis, crossing the Mississippi River at St. Louis. Kansas itself is 425 road miles across and Missouri about 250. The eastern plains of Colorado and west-central Kansas are about as flat as a pool table, and there are basically no trees until you near Topeka, Kansas, closing in on Kansas City, some 625 road miles distant. To add interest to the trip, I decide to see how far I can hear three prominent Denver stations: KHOW-630 (5KW), KKZN-760 (50KW), and KOA-850 (50KW). 760 KHz and 850 KHz are clear-channel frequencies. I am DXing on a 2006 Ford Ranger truck radio. The truck radio is adequately sensitive and uses a short whip antenna. I cross the Colorado-Kansas state line, 160 miles out, about 1300L. All three Denver stations are still powering in, even lowly KHOW-630 at 5KW. No difference in strength can be discerned. Remember, it is daytime, and midday. The D-layer has long since "re-coagulated", and we are well outside the 2-1/2 hour guard zone around sunrise and sunset. It always amazes me why these extreme daytime MW DX distances are common out west, and I rarely see this happen in the east. My fellow Ham buddy Jeff, K3OHU, says it is due to all the clutter in between station and receiver that attenuates the signals. Out west are wide-open spaces. Perhaps he is right. I proceed on, as I plan on driving another 2-3 hours before stopping. I pass Goodland, Colby, and Oakley, Kansas, closing in on 300 miles now. The three stations continue to hang in, very strong. I might expect that of KKZN-760 and KOA-850, both 50KW stations, but not of KHOW-630 at 5KW. At 1530L, I pull into Hays, Kansas for the night, some 309 miles as the crow flies from Denver. KHOW-630 has weakened some, but is still of medium strength. KKZN-760 and KOA-850 are still powerhousing through the truck's speaker. Somewhere in the last hour I have crossed into the Central Time Zone, losing one hour. Tomorrow, Tuesday, should be interesting, and we shall see what and who shows up in the morning. Hays, Kansas. I am up at 0530L and back on the road. It will still be dark for another hour. Intermittent low fog hugs the road, mile after mile. I take a scan around the band to see what's happening. Within fifteen minutes I hear all four sides of the country - the west coast: KFI-640 Los Angeles, CA, the east coast: WSB-750 Atlanta, GA, the northern border: WCCO-830 Minneapolis, MN, and the southern border: WWL-870 New Orleans, LA. Also heard before 0630L and daylight are WGN-720 Chicago, IL, WBAP-820 Dallas TX, KEEL-710 Shreveport, LA, and KOKC-1520 Oklahoma City, OK, all with strong signals. Things are about to get interesting. East of Hays, Kansas, and still dark out, the three Denver stations are nowhere to be found, buried, I suppose, under the jumble of nighttime signals on their frequencies. It starts to get light, and I hurtle east across central Kansas, wondering if this will be the end of hearing daytime Denver DX for this trip, as I will soon be out of range. Nearing Salina, Kansas, stations to the extreme east are fading away due to the impending sunrise. WSB-750 Atlanta fades, as does WGN-720 Chicago. Popping up on 720 KHz now is a strong signal out of 50KW blowtorch KDWN, Las Vegas, NV. KFI, Los Angeles, holds its own on 640 KHz. I tune to 740 KHz looking for KCBS in San Francisco, expecting something further up the west coast, but nothing. KGO-810, San Francisco, is also absent. Next I tune to 770 KHz - the channel was vacant just a little while ago - and now there is powerhouse KKOB in Albuquerque, NM. I have a quick breakfast in Salina at 0645L, then back on the road at 0730L. East of Salina, Kansas, the sun is well up now. A pleasant surprise! Denver's KOA-850 is back in there, alone on frequency. KKZN-760 is in there too, but competing with KCCV-760 (6KW), a religious station in Overland Park, Kansas, near Kansas City. KHOW-630 has not showed. I come to Topeka, Kansas at 1020L. The low fog is lifting. It is more than 2-1/2 hours past sunrise and into the daytime DXing timeframe now, and the nighttime skip has totally vanished. KHOW-630 has still not reappeared and I suspect we are out of range for it anyway. KCCV-760 in Overland Park has overtaken Denver's KKZN-760, I figure for good, as KCCV will only get stronger as I approach Kansas City. By then, presumably KKZN will be out of range. KOA-850 hangs in there quite nicely with a nice medium strength signal all by itself. I roll through Kansas City, crossing the Missouri River, and on into the state of Missouri at 1135L. KOA-850 is still hanging strong. KKZN-760 is completely obliterated by the Overland Park station KCCV. I press onward for Columbia, Missouri, just past the center of the state, another 120 miles distant. Fifty miles inside Missouri at 1220L, the Overland Park station fades, revealing Denver's KKZN-760 again, at a good signal strength. KOA-850 continues to hang fairly strong, still alone. Surprisingly, the signal strength of these two are still respectable through the truck's speaker, and arm-chair copy. KHOW-630 is still absent. I hear a weak religious station creeping in on 630 KHz, probably KJSL-630, St. Louis (5KW), nearly 200 miles in front of me. I am getting close to my personal daytime DX record of 675 miles. Ironically, that is held by KKZN-760. I have received it twice while in southwestern Arizona. I pass through Columbia, central Missouri, at 1330L after stopping for a very quick lunch. The excitement is building, as I am now passing my daytime MW DX distance record mark of 675 miles, and I have two stations still in contention for a new record. I can hardly contain myself. To my amazement, Denver's KKZN-760 and KOA-850 are still hanging in with weak to medium signals, well above the noise level. The fades and peaks have become long and drawn out, perhaps 20 or 30 minutes between them, but even the fades are still readable. What gives? I have never heard MW DX signals at this strength at this extreme distance during the daytime. The Denver weather report on KOA indicated fog still on the ground in the Denver area at their 1130 AM local time. I start to wonder if the ground fog is part of this scenario? A few minutes go by, then bad news. I start to hear splatter on KKZN's signal. The splattering station, at 770 KHz, is playing a sort of ethnic variety music, so I assume it must be coming from station WEW-770 (reportedly 10KW), located in St. Louis, Missouri. This can only get worse as I close in on St. Louis, and I fear that in time I will lose KKZN permanently to it. To make matters worse, underneath KOA-850 another station appears, gaining in strength. I can't identify it yet. East of Columbia, and less than 100 miles from St. Louis and the Mississippi River, I decide to check for WSM-650, Nashville, Tennessee, the famous Grand Ole Opry station. This spring on my trip out it carried well into southern Missouri, down the I-44 corridor. I tune to 650 KHz. There I find a station, weak-to-medium, in the clear. I listen for ID, as the 1400L news is on but I missed the top-of-hour. They give the local weather report. Something about Wyoming and Cheyenne. What is this? No, it can't be! Then the ID comes. "This is KGAB, 650 AM, Cheyenne"! I can't believe my ears. KGAB near Cheyenne, Wyoming transmits with a power of only 8.5 KW! But there it is with a perfectly listenable signal strength through the truck speaker at an amazing daytime distance of 710 miles! The local time is 1405 CDT, and an hour earlier at 1305 MDT in Wyoming. KGAB is totally in the clear, without side splatter or other interference on-frequency. The thought occurs to me that I'm only about 100 miles from the Mississippi River and the Illinois state line, and I begin to wonder if the two Denver stations and Cheyenne will hang in there long enough to get to the river. I race towards the Mississippi, as things are starting to deteriorate on all fronts. The stations are getting weaker. Denver's KKZN-760 is getting hit very hard with 770 KHz splatter, and is almost unreadable now. KOA-850 is almost totally covered up with co-channel interference. I identify the offending station as KFUO-850, coming closer by the mile, in Clayton (St. Louis), Missouri. Little KGAB-650 in Cheyenne, Wyoming is weak but still readable, and in the clear. The fades take it totally out, then it re-emerges for several minutes at a time. The Glen Beck program is on. It started after the news at 1400L CDT. 54 miles to the river. And one hour. I've got to do something. I pull off the exit at Warrenton, Missouri, thinking I will attach a four foot length of wire to the truck antenna and let it trail in the wind while I drive. I've used this technique before to gain some signal strength and pull in distant DX. I attach the wire and continue on down I-70 towards St. Louis. Signals are marginally better, but the 770 KHz splatter is killing KKZN-760, and KOA-850 has finally disappeared under St. Louis's KFUO-850. Wyoming's KGAB-650 hangs in there, barely. Traffic builds as I approach the river. The only station left is KGAB-650. It is right at the noise level. At exactly 1505L I cross the Mississippi. Just over the bridge I faintly hear Glen Beck say a few words just above the noise level - what, I don't know - but I can recognize his voice. Then - gone. KGAB fades below the noise for good. I am in Illinois. To the left of me I pass two AM radio stations. One has an array of four towers and the other six. The receiver desenses so badly that it overloads. I press on wondering what will happen next. Pocahontas, Illinois. It is 1545L time. Hurriedly, I pull off the exit and into the motel parking lot where I will stay for the night. After registering, I check the truck radio again. Surprisingly, 760 KHz is clear of splatter - but nothing but noise is heard - and no KKZN. 850 KHz is occupied by St. Louis's overwhelmingly strong KFUO. Weak but steady, 650 KHz plays the country music of Nashville's WSM. KGAB-650 is gone, forever. Quickly I grab the Tecsun PL-600 out of the truck and tune to 760 KHz. I put the headphones on. Something is there just at the noise level, but what? In a greater hurry, I dig for the 24-inch passive loop I constructed this winter. The PL-600 is still two feet from it when the signal on 760 KHz comes right up out of the noise, nearly arm chair level in the headphones. It is Progressive Talk Radio, KKZN-760, Denver, Colorado! Unbelievable! A new personal daytime mediumwave DX record of 827 miles! Imagine hearing the front range of the Rocky Mountains - some 36 miles east of the Mississippi River in Illinois - IN THE DAYTIME! Who knows how far into Illinois I could have heard KKZN-760? With the interference from KCCV-760 gone, its signal was still respectable off the 24-inch loop at the town of Pocahontas, some 36 road miles east of the Mississippi River. My guess is another 50-100 miles, closing in on 1000 mile daytime DX! What makes the difference in long distance daytime DX? Clear co-channels and clear adjacent channels are very important. Flat, unobstructed terrain I'm sure is important too. Ground conductivity is very important. Ground conductivity from Denver to central Missouri ranges from 15-30 millimhos per meter. From central Missouri eastward to the Mississippi River it drops to 8, then rises back to 15 east of the Mississippi River. Did partial fog along the distance also make a difference? Possibly, but I will never know for sure what effect it had. It is remarkable what a 24-inch tunable, passive loop will do for a signal seemingly buried in the noise at 827 miles distant. I was astounded. I really enjoyed your story about daytime DX. Thanks, gkinsman. Glad you liked it. That day will be a memorable day in my life of DXing. My theory is that the space shuttle landing track across this area had something to do with it, such as disrupting the normally absorptive D-layer. I am hoping the remaining missions will follow a similar glide path down, and it will happen again. The next one after April came in over Central America, Cuba instead. Thanks for your comments, Glenn. Yes, I did read your theory on the space shuttle reentry, it is certainly plausible. Hopefully we can experience this phenomenon again. I will certainly look for it. I believe that is 50kW 700 KALL North Salt Lake City, UT, at a distance of 626 miles. How far have you heard stations with power levels of 1kW or less above 1200kHz? Also, a few years ago, while local signal 1240 KSON (now KNSN) was only broadcasting an unmodulated carrier, I heard the then-outlet for Radio Disney from Albuquerque, NM, on the same frequency. Albuquerque is east of me, and my local 1240 is 11 miles west of me, with a signal strength of about 54-55dBu on my PL-380 (which I didn't have at the time), and strong enough to wipe out the graveyard mess when it is actually broadcasting content. I didn't get a recording of this one, though. Your KALL-700 catch was outstanding. Congratulations. My best daytime catch from western Arizona has been KKZN-760 in Thornton, CO, just north of Denver at 674 miles distant. The trip east this spring was astounding, as I related in the blog story. All that was heard on a truck radio. Glen Hauser seems to think the DX that day was caused by space shuttle atmospheric ionization on reentry. I don't know. I guess it's possible. Ground conductivity is pretty good east of Denver all the way to the Mississippi. I think that played a major part, as did the weather that day. Don't have much info to offer on low power DXing above 1200KHz. I'm usually DXing down at the lower end. I sometimes DX in the X-band (1610-1700KHz) but that is usually at night. At home in New York, near Rochester, during the daytime I often try for X-band Canadian stations across Lake Ontario at about 100 miles distant. CHTO-1690 comes to mind, at 3KW power. Two others are running 1KW. Thanks for the great sound clips. If I remember correctly, when I heard KALL, it was under 41,00 or 43,00 desense or so, with local XEWW-690 nulled, due to the Select-A-Tenna not being quite selective enough to knock it down. I almost suspect that if the strong locals weren't there to desense it, I may be able to hear KALL barefoot in the daytime strong enough for soft mute to not kick in. Speaking of X-Band nighttime DX, I remember hearing the two DFW airport TISs before anything else was on. Also, I remember reading on another site that Bruce Carter in Texas (Lubbock or Dallas, don't remember which), with a 4-foot loop antenna, was able to hear some impressive daytime DX, including the low-band 50kW Chicago clears at/over 1000 miles. Yep, done all of that over the years - metal fence, wires, bedsprings, grounding wires, etc. Been at this radio thing for 50 years now. hehe Sometimes you get curious and usable results too. I remember that Bruce Carter article about the 1000 mile DX. Don't have the article so I went looking for it and found it (a PDF). Will have another read of it when I get a chance. I guess if 827 mile DX is possible (mine), 1000 mile DX is too. Daytime DX across the ocean may be possible if the distance isn't too great. I just noticed something. Take a look at KKZN's pattern, especially the FCC database one. If you could receive it in Pocahontas, IL, under those circumstances, I wonder if it might be possible to hear them in San Diego, CA... IF either A - you're at a 90° angle from KFMB's transmitter, like I probably would be, or B - KFMB happens to be off the air? As for some of the other stations, I suspect KGAB-650 would be difficult due to KFI-640's IBOC hash and the distance, and KOA-850 would be difficult due to co-channel XEZF-850 in Mexicali, as well as local adjacent XEMO-860 in Tijuana. With the radios you use, how well do the various San Diego and nearby area stations get to Quartzsite, AZ, during the day, including XESURF-540, KOGO-600, XESS-620 (KTAR may wipe this one out), XEWW-690, KFMB-760, XESPN-800, XEMO-860, KECR-910 (I doubt this one due to co-channel XEAO Mexicali), XEKAM-950, KCEO-1000, XESDD-1030, KURS-1040, XEPRS-1090, KSDO-1130, KCBQ-1170, KPRZ-1210, KNSN-1240, XEAZ-1270, XEC-1310, KKSM-1320, KLSD-1360, XEKT-1390 (the sites say it's on 1380, but it's actually on 1390 and I guess about 5 or 10 kW), XEXX-1420, KFSD-1450, XERCN-1470, XEBG-1550, XEUT-1630, or XEPE-1700? Also, what about some other stations, all of which I can receive here during the day with the right equipment (and some are fairly good just with a built-in loopstick), like KBLU-560, KFI-640, KBRT-740, XESU-790 (here it's under KABC), XEVMS-820 (or is it XEABCA? ), KLAA-830, XEZF-850, KNWZ-970, XED-1050, KNX-1070, KDIS-1110 (difficult here due to KSDO-1130, and I'll stop the list there)? KKZN-760 has a major lobe pointed at you during the daytime, some 110KW ERP. It might be possible to receive them. I have heard them in western AZ. At night they are down to 1KW, with a notch in their pattern pretty close to your direction. KOA-850 might be receivable if you could null the Mexican station enough. KGAB-650 is fairly low power, only 8500 watts daytime, but omnidirectional. At night they drop to only 500 watts, pointed northwest. Probably not much chance there during nighttime hours. I'll check those other station's strengths when I get to AZ this winter. I do receive KOGO-600 in Quartzsite, though they are off the back side of their pattern. However, they are weak and I seem to recall some other interfering station in there too. That would be quite an accomplishment if it could be received here, as I'm only, per my calculations, 7.3 miles, 320° (toward their TX) from co-channel KFMB, and it easily pegs the 63dBu meter on my barefoot PL-360. I have sometimes been able to get a fairly good null on them, but it's a strong enough station so that I usually get the uneven sideband type fade and that distorted sound when I null them. KOA may be a little easier, if I could, like you said, null that Mexican station on 850. Then, there is the local from Tijuana on 860 to contend with, too. KGAB's low dial position may help, but KFI's IBOC probably doesn't help. I think there may be a station in Flagstaff on 600. I haven't had much success with daytime DX to the east, much. Farthest I've gotten is KALL-700 North Salt Lake City, UT, but that's more north. I've heard several of the Imperial Valley and Mexicalit stations, as well as KBLU-560 (this one can sometimes be faintly heard barefoot), but Phoenix and other areas farther east are tough. As for KTNN-660, my local on 540 apparently seems to broadcast a weak spur on that frequency, so that's what I hear in the daytime when I try to amplify 660. Enjoyed your recount; came away feeling like I rode with you. RADIO-TIMETRAVELLER is a blog about radio and radio DXing, antennas, opinions, reviews - basically all things concerning radio. My particular emphasis is mediumwave, mediumwave DXing, and the technical side of radio and propagation. My passion again in the last few years has been DXing the medium waves during daytime hours. I hope to bring some interesting articles, ideas, and facts to these pages, not just dry reception reports. I have been DXing since the late 1950s. Currently licensed as ham call WE7W, I have been a ham since 1963. I spend my time on both sides of the country. Part of the summers are spent in Avon, New York, a small town 20 miles south of Rochester. A sizable chunk of the year is spent in a small town in southwestern Arizona in the desert along the California border. The DXing is great in the desert! The dBµ vs. dBu Mystery: Signal Strength vs. Field Strength?